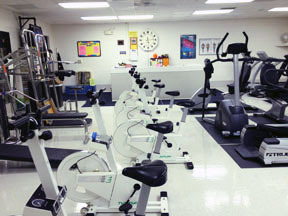 The DACC Fitness Center is available to students, employees, and community members enrolled in Fitness Center courses. If interested in attending, register using the online registry or call 217-443-3222. During the registration process, you will be registered for a free orientation for the Fitness Center facilities and policies. The Fitness Center is closed when the college is not in session. No students, faculty, staff or retirees will be permitted to use the center when it is closed. Treadmills, Recumbent Bikes, Stair Machine, Upright Bikes, Elliptical Machines, and Weight Toning Circuit. Attendees can also earn workout credits by attending the group fitness courses such as Yoga, Pilates, and Boot Camp (Free Weight Training is excluded).